The Oil States Multiport Selector Valve (MSV), also known as the Rotary Selector Valve (RSV), is a highly efficient fluid-control system that allows for two-way diagnostic communication. The eight-port valve typically serves seven wells to a group port, such as a holding tank battery, while the remaining port can send product to another location like a testing lab. This permits in-line testing without taking the remaining wells off line. Manual or remote operation available by an actuator controls automation of the flow. 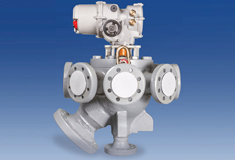 Models are available in pipe thread or ANSI Classes 150, 300, 600, 900 or 1,500 RF flanged connections. Self-contained skidded units are available with oil and water separators included. See Multiport Selector Valve animation here. Automated flow control with two-way communication. Cost-efficient flow control by serving seven wells at once. Self-contained skidded units for quick change out. Compact, simple, low-maintenance with automation add-on at any time.